Yesterday was the loveliest day ever. I finally managed to make it to the Botanic Gardens and serendipitously it was the Singapore-Germany Jubilee Concert in the park. Great jazz music, free pretzels and picnic mats and other freebies…what’s not to like? But it was a little optimistic to expect to go out to the park again today as the haze crept back and we’re all effectively confined indoors again. 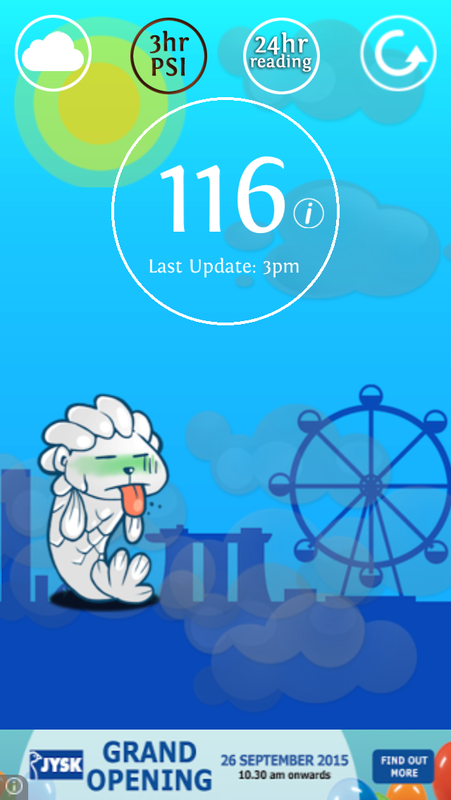 The Haze@SG app that shows how miserable the Merlion is with the severity of hazy conditions. Anyway there is plenty to potter around and do at home. I just bought a new spice organizer and decided to clean out my spice drawer. It usually takes me a good 5-10 minutes usually to locate and extricate the spices I need for any one dish and I confess there were times where the flavouring of the dish was determined solely by which jar of spices was at the top of the heap. I had a happy time of it, pandering to the OCD part of my nature and labeling each spice bottle both in front and on top of the container. It brought me back to the days I used to work in the lab and I used to have the most obsessively organized bench around. It didn’t always work out well for me however as my bench was the default place for people to filch things from because it was so convenient. Anyway it was cathartic for me to throw out old spices and reorganize everything so that I can now pick out what I need at a glance. The reason for this grand enterprise was that I have about 30 containers of herbs and spices in my spice drawer. 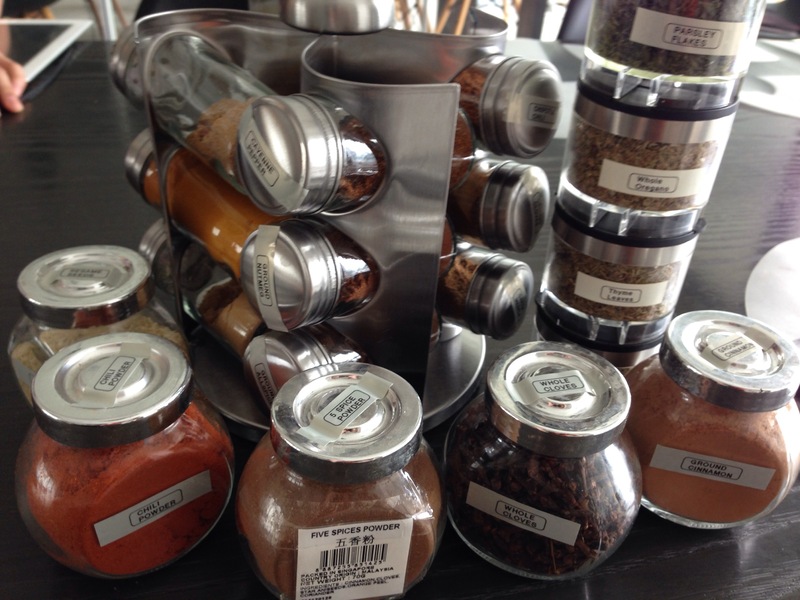 I think the only spice I don’t have at the moment is sumac…which I’m not sure where to get in Singapore. The last time I got sumac was in Egypt a few years ago. When I travel I have a terrible habit of heading straight to the supermarket to check out spices, condiments and low carb snacks. Which explains the clutter I have in my cupboards. Ground spices in the 12 bottle carousel, dried herbs in the stackable canisters on the right and large quantity herbs and spices in the IKEA spice bottles in the front. My mini spice and dried herb wonderland. Anyway on the recipe front, I am bringing to you the exact opposite of prolonged and leisurely pottering – a super quick 1/2 hour max recipe (15 minutes of you have everything at hand). 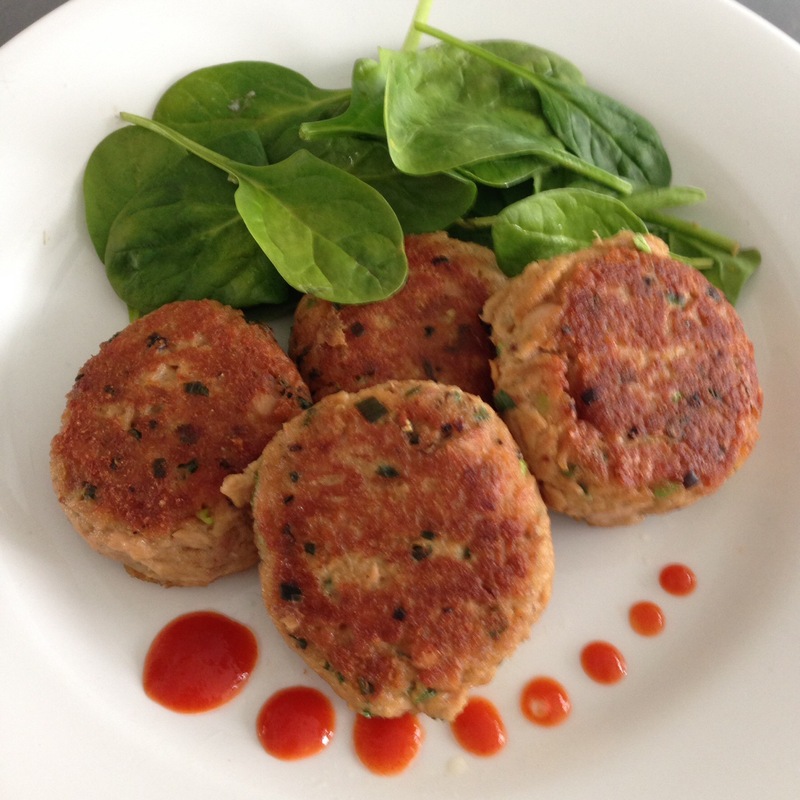 Tuna patties are cheap, good and easy especially as canned tuna is something I always have at hand in my pantry. Tuna patties are great as an appetizer (although it was actually my breakfast) and you can pretty much throw whatever seasoning you want into the patty. This time I decided that mustard and horseradish would amp up the patties; most other recipes use hot sauce or Tabasco sauce to do that. Now that my spice drawer is in order though, I can probably be a lot more adventurous the next time I do this recipe. Mix in the cracker crumbs, spring onions, eggs and mayonnaise in. Add the fish sauce, mustard, horseradish, salt and ground black pepper in and mix well. Form the mixture into patties, and flatten slightly. Heat up the oil in a non-stick skillet over medium heat. Carefully place the patties in the pan and fry for about 2-3 minutes per slide. Remove and drain off oil on kitchen towels. Thank you for this idea. I love tuna and I hv been trying to get T to enjoy it too. I’ve only done it in a pasta or salad style for him. I will do this for him tmr for his dinner. One can tuna only makes 4 patties? Yes. So if I am making for the family I usually double the recipe. Prepared it for T’s lunch today. He enjoyed it very much. Placed them on a salad.